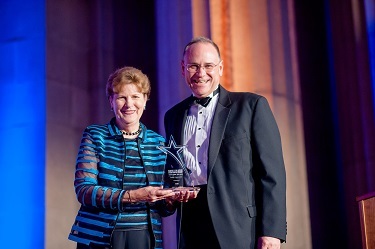 21 Sept 2015 -- IBM received the 2015 Chairman's Award from the Alliance to Save Energy at its 23rd annual Evening with the Stars of Energy Efficiency Awards Dinner on September 17 in Washington, D.C. This award recognizes our company's longstanding and comprehensive global energy management program, as well as the impressive results that we achieved. The Chairman's Award is presented to an individual or organization that has shown exemplary service to the cause of energy efficiency. "We are honored to receive the Alliance to Save Energy's 2015 Chairman's Award from Senator Jeanne Shaheen," said Wayne Balta, IBM's Vice President of Environmental Affairs and Product Safety. "IBM has been firmly committed to environmental leadership for decades. We substantiate our commitment with demonstrable results." U.S. Senator Jeanne Shaheen presents the Chairman's Award to Wayne Balta, vice president, IBM Corporate Environmental Affairs and Product Safety. IBM formalized its energy conservation and management program in 1974 and has continued it unabated ever since. Our global energy management program leverages the expertise of more than 50 IBM energy management professionals deployed around the world. As part of this program, IBM collects extensive data from its locations and applies analytics to better recognize and understand patterns of energy consumption. These insights, in turn, enable new actions which save energy. In 2014, we reduced or avoided the consumption of 404,000 mega-watt hours (MWh) of energy avoiding an associated 142,000 metric tons of carbon dioxide (CO2) emissions, and saved $37.4 million through the execution of over 2,200 energy conservation projects. Energy conservation savings were equivalent to 6.7 percent of IBM's 2014 global energy consumption, exceeding our energy conservation goal of 3.5 percent. Having performed traditional projects for energy conservation for decades, our efforts are becoming increasingly dependent on IT-based systems and solutions to deliver additional conservation savings across systems in buildings, data centers, and chilled water plants. IBM's analytics and management software, TRIRIGA® Real Estate Environmental Sustainability Manager (TREES), is a key component of a company service named the IBM Building Management Center which IBM has deployed in over one third of its global space. The TREES solution integrates existing controls infrastructure across a location, collecting data on an hourly basis and analyzing it for anomalies. IBM has sustained an average of 10 percent reduction in energy use annually since 2011 for the buildings and systems monitored and managed by the TREES solution. In 2014, the 28 connected sites achieved y savings of 30,500 MWh and $1.6 million. Since the start of our deployment of TREES in 2011, total savings of 78,700 MWh and $4 million have been realized. IBM has also offered this technology to clients and applied extensions of the TREES solution to 81 buildings managed by the US General Services Administration, saving $14 million over the past 2 years. We will continue to aggressively pursue both traditional conservation projects and innovative software based monitoring/management solutions to drive greater efficiency in IBM's building systems and operations. IBM was previously recognized with a Star of Energy Efficiency Award from the Alliance to Save Energy in 1998. For more information about our energy conservation and efficiency initiatives, see our climate protection page. The Alliance to Save Energy promotes energy efficiency worldwide to achieve a healthier economy, a cleaner environment and greater energy security. Founded in 1977, the Alliance to Save Energy is a nonprofit coalition of business, government, environmental and consumer leaders. For more information, see the Alliance to Save Energy website.